Right now I’m showing you these 3-in-1 transforming/expanding shipping container shelters designed and built by MSS. The units are easy to ship since they’re the size of a shipping container so you can have it moved just about anywhere pretty easily. Once you have it on site and deployed you’re able to triple the size of the unit in just a few minutes. This isn’t necessary for most of us, but I think it’s fun and worth taking a look. Watch the videos below to see how it works. Enjoy! Our big thanks to Debbie Gannon for sharing this incredible 3-in-1 transforming shipping container tiny home with us! If you enjoyed this 3-in-1 transforming shipping container tiny home you’ll absolutely LOVE our free daily tiny house newsletter with more! Thank you! I really like video 1, the folding shelter. Are they in production? Any for sale? Cool idea for those who prefer a portable home. In that vein, what kind of trailer does it require and what kind of truck to pull it? I imagine that a heavy metal shipping container filled with belongings and accoutrements weighs a whole lot more than a wood structure. For practicality purposes, it is not so portable if it requires a flatbed truck equipped with a crane. The foldout container is best because when you would like to have more space but wanna be still mobile towing it with your own truck. You can put bathroom, kitchen and closets in the middle. The downside your furniture needs to be folded. The military version shown is quite expensive and you can’t find them second hand. 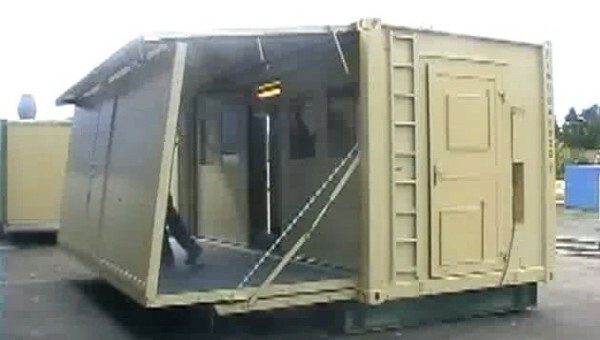 There is a company in Texas which is building civilian ones including a trailer but they aren’t as rigid as the military ones to withstand hurricane force winds. I would prefer the rigid one but the price tag exceeds 65,000 dollars. Superb idea seeing as shipping containers will naturally fit securely on almost all commercial flatbed trucks available on the open market these days!! In the vein they are naturally able to be transported virtually anywhere in the world by ship (it is a “shipping container” after all 🙂 ) and then by lorry !! (if ice road truckers can take the self same shipping containers to the outer reaches of Alaska, through the roughest, coldest and harshest conditions the worlds weather can throw at us, all be it a standard non converted shipping container) then I am sure the bulk of us could ship these anywhere we choose with a little pre planning and forethought. As for these particular ones being military and this not available on the open market? I would suggest respectfully that that’s boulderdash frankly as ALL military equipment regardless of cost or original uses, comes up for auction at some point in its useful life cycle via storage auctions, you just have to be in the know to gain that information (the cost of an auction catalogue is all one requires on the day of said auction to legally bid upon, and thus hopefully end up owning one in “military grade, extra hurricane force trim” to take home at the end of the said auction. But what a superb idea as I said at the start of this post, easily replicated for either as harsh weather and obviously not so, with endless verifications inside kitchens, bathrooms and bedrooms all easily build able from a wholly empty shell including first fix electrics and plumbing in virtually any position you could wish for internally by simply supplying the fitted plumbing and suitable electrics to diy fix a toilet, sink or shower too, and of course a kitchen or even a shower, steam or sauna too given a little extra thought too, as I say the end less choices could make for some pretty rad properties at the end of the day! And lastly they by nature of their start in life could very easily be transported many on top of each other with minimal extra security (just view the main shipping lanes in Europe and beyond where you will immediately spot lots of “ships” full of “shipping” containers likely 6 or 8 high possibly more depending on its start and finish locations making this a natural rapid ready rehousing proposition for disaster struck regions surely!! And more exciting than all of that IF the price could be taken back far enough to viably produce a home/diy version we could possibly start seeing these units on holiday parks or odd scraps of land the world over in areas of natural beauty or spectacular sports or such locations simply for their size and shrink abilities whereby when the holiday or extended vacation is over they are simply packed back up and either taken back with the owners or better still packed back up and either easily stored one on top of another until again wanted but as a worse case scenario packed back up 100% secure from break in or vandalising which would make it to the average holiday home owners worth a sabstaintial sum over the top of what an equivalent sized property is currently worth. Without thinking about it, I can see numerous markets for such a property even just up here in the Highlands of Scotland for holiday or the native dwellers seeking safe, secure comfortable homes a winner all round at the right price I would hasten to add and one that would interest me if affordable I am sure of that much, saving years and years of expense, costs and ongoing repairs. I was living in one of these nearly twenty years ago. They were also common in the post 1982 Falklands I belive. Made by a firm called Corimec (http://www.corimec.com/inglese/corimec.htm). Love it. Reminds me of the U.S. Army portable operating room. I sooooo want one for a little but tuff as nails home. Don’t let us in dark. Please, tell us if it is for sale and how much it cost.